BedLounge Classic - Regular - Natural Cotton by BedLounge at Doctor Joe Says. MPN: 1040401. Hurry! Limited time offer. Offer valid only while supplies last. If you are looking for comfort and support from an upright reading pillow while doing homework, reading and watching TV in bed then look no further. If you are looking for comfort and support from an upright reading pillow while doing homework, reading and watching TV in bed then look no further. The BedLounge is the absolute perfect addition to your bedroom, dorm room and family room. It works for kids in the family room as a TV, gaming or reading support pillow. The BedLounge has an adjustable head support for additional comfort. 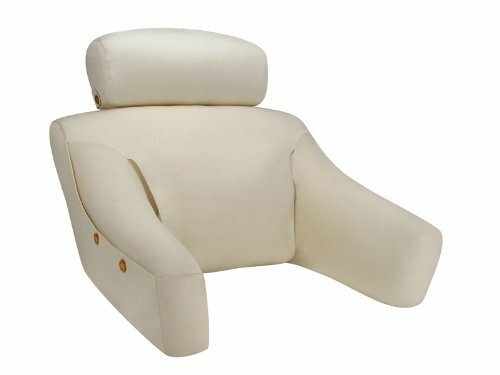 The adjustable arm rests flex not only in and out, but up and down, which makes reclining while reading easy. The BedLounge is completely portable, it weighs less then a down comforter. The arms can be brought in and tied, and then the BedLounge is easily transportable, or folds up for easy storage on a shelf or in your closet. The Inner framework of the BedLounge is adjustable and allows for upright reading to lounging with an easy chair feel, right in your bed. The BedLounge is infinitely adjustable. You can adjust the back and headrest creating a custom fit to support you. The fully adjustable headrest raises and lowers over a foot and moves forward 90° to cradle your head and neck. The BedLounge down-filled cushion provides full upper body recliner support and helps to relieve the day's stress and anxiety. Side pockets easily store your books, medications or the TV remote control. Ergonomically Designed to Fit You / Headrest extends up to 12"
If you have any questions about this product by BedLounge, contact us by completing and submitting the form below. If you are looking for a specif part number, please include it with your message.